The Eighth meeting of the FY19 Safety Council Program year will be held on Thursday,February 7th from 12:00 Noon to 1 P.M. at the St. Clairsville Recreation Center. Topic: Developing Field Based Safety Leadership, it will be a 2 part series. Part 2 will be March 7th. Joe Kopko has over 15 years of experience in managing safety, health, and environmental programs, including 11 years in private industry. Prior to joining HUB, Joe worked with industry leaders in the manufacturing and construction sectors, and was awarded the National Safety Council “Top 40 under 40, Rising Star of Safety”. He was also recognized by Indiana University of Pennsylvania as an “outstanding young alumni”, for his work in the field of injury prevention and risk management. Joe oversees the strategic servicing of our clients to overlap their insurance program with the appropriate technology and service strategies to create a proactive risk management experience. As an experienced risk management professional, Joe provides a cyclical “prevent and control” methodology to help keep his clients focused on leading indicators and integrating calibration points to prevent loss, monitor engagement, and improve communication to reduce their total cost of risk. He is currently working with data analytics partners to integrate the employee benefits and workers compensation programs to provide better outcome management, monitor absence, and support overall employee health.His primary specialty is in developing leadership and management teams to support a sustainable, culture of prevention and resiliency. Additional areas of specialization are in safety, ergonomics, productivity enhancements, organizational culture, knowledge/behavior transfer and learning, and predictive analytics. He has also developed a Safety Leadership and Workforce Development program. ​To make reservations, click on the make reservation button, call the Chamber Office at 740.695.9623 or email: administrator@stcchamber.com. If you have emailed your reservation and you do not receive a response, please try again as a confirmation email signifies that we have received your reservation. 12 noon to 1:00 p.m. Registration begins at 11:30 a.m.
$20.00 at the door for walk-ins. We ask that you make a reservation to ensure that we have adequate seating and food for all of our attendees and speakers. 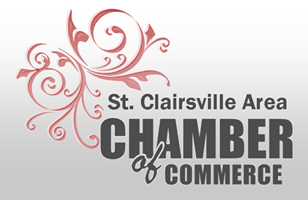 Copyright 2013 St. Clairsville Area Chamber of Commerce. All rights reserved.